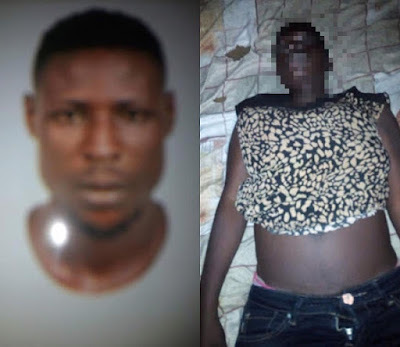 One Islamat Bolaji has been beaten to death by her estranged lover, Okiki Arisekola, a commercial bus driver, during a scuffle on September 16. The incident happened at No. 50 Wright Street Adekunle, Yaba, Lagos, where the victim lived with her grandmother, Gbemisola Agboola. According to Sunonline, Islamat was nursing a little child she already had with her killer. She died during a quarrel over the custody of the little baby, named Kemi. Arisekola, said to be on the run, had reportedly been frequently visiting the baby and his mother, a development that aroused suspicion, due to the no love lost between the two lovers. “He has not been visiting my daughter, but recently he just started coming and my daughter grew suspicious of his visits. On the fateful day, when he came, they were together at first, then he left, on his return, they started quarreling. But, this time, it led to a physical fight and Okiki beat my daughter into a coma. After some minutes that he had left, my daughter fell and became motionless. We rushed her to the hospital and it was there she died,” her grandma recalled. "He demanded to take the girl away but she rushed to take the baby from him. They dragged the baby between them. She feared that he was going to use the child for rituals. It was a passerby that called my attention to Okiki merciless beating of my granddaughter, I almost had high blood pressure, I rushed out and called my granddaughter. As I was leading her back into the house, she fell and fainted. The first hospital we took her to didn’t have doctors on call, but before we could get to the health center, she died,” the grandmother added.